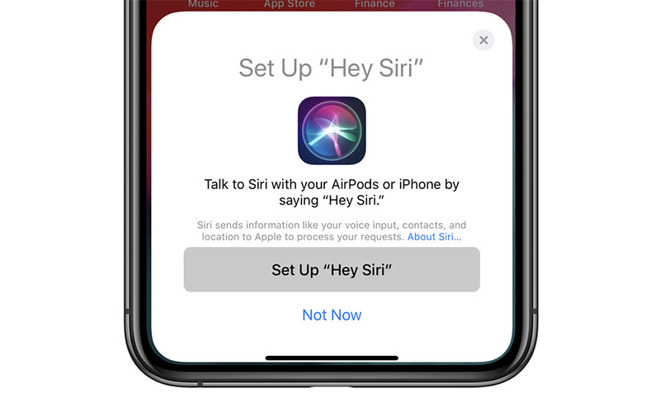 Discovered by 9to5Mac's Guilherme Rambo, the setup screen is nearly identical to Apple's existing "Hey Siri" configuration prompt, but for the first time includes mention of AirPods. Currently, the "Set Up 'Hey Siri'" window is restricted to iPhone. The screen included in Apple's latest iOS beta version for developers is currently obscured from public view, suggesting the company wanted to keep the feature under wraps prior to an unveiling. According to Rambo, "Hey Siri" for AirPods will be nearly identical to the same feature for iPhone, the difference being AirPods hardware is expected to handle voice recognition. The earbuds will wirelessly transmit commands to a paired iPhone, allowing users to invoke Siri without pulling out and speaking to their handset. Considering current AirPods components do not support "Hey Siri" functionality, the setup screen's discovery strongly hints at a near future launch for Apple's widely rumored next-generation AirPods model. Rumblings of an AirPods refresh first circulated in early 2018, when Bloomberg claimed Apple was working on a follow up to its extremely popular wireless headphones. "Hey Siri" functionality was said to be a major feature addition. The report anticipated a 2018 launch, but those estimates proved incorrect. In December, analyst Ming-Chi Kuo predicted Apple to debut an updated AirPods product with wireless charging and a Bluetooth specification upgrade in the first quarter of 2019. The new device might also incorporate a revised W-series chip, an inclusion anticipated to power Apple's "Hey Siri" feature. Earlier this week, a report echoed Kuo's claims, but added unspecified health tracking capabilities to the list of improvements.